My Generous Life: Bedtime struggles are getting worse and worse. The most popular tips were the sleeping schedule, basically a regime for their sleeping hours, putting them to sleep in the right moment, or introducing a comforting bedtime ritual...well, i must admit that lately we became very inconsistent with the sleeping schedule. Before the holidays the girls used to have a strict sleeping routine and indeed were sleeping through the night, at least for 8-10 hours without waking up.. some friends just told me that it s a phase and will pass away, but my impatient character can't accept this excuse...so i started searching in the web for experts advice..i was surprised of how many sites and blogs are exclusively dedicated to this issue...too many moms are suffering?! my sleeping beauties, on our bed! i am not fond of Ferber's / cry it out method (let the baby cry until she falls asleep), so after an extended survey, i started reading the TRacy Hogg's book Baby-Whisperer-Solves-ProAblems which i found till now very interesting...tonight i am going to partially implement her theory, adjusted of course on our wills and needs. Let's see if it works...even though putting the twins to sleep is more complicated since one may start crying and the sleeping baby may wake up...I would love advice and thoughts from those who have done it! - talk to the baby before leaving the room, to ensure the routine and so as they know that to expect. Try something like"now you are going to have your nap. I will see you when you will wake up". My variation is that i don't leave the room, I stay there until they fall asleep. - if the baby cries, comfort her. If she remains fussy, pick her up- put her down until she calms down. Pat her on the back and whisper shh-shh,, Don't let the baby cry desperately. dependent on the "prop" that she associates with sleep. *Next directory released new models! 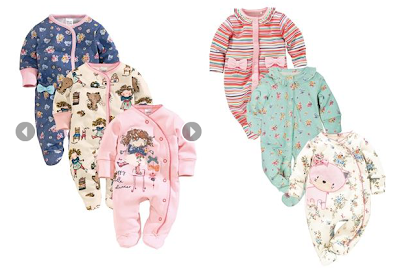 (they have the cutest sleep-suits ever in the best price and without shipping costs!) i already placed my order! - η τακτική pat & whisper ..και η pick up/pick down...εμένα έπιασε η πρώτη, για την δεύτερη δεν έχω τόσο ισχυρή προσωπικότητα, και στο τέλος οι μικρές καταλήγουν στο κρεβατι! - η μη ιυοθέτηση συνηθειών όπως το γάλα αν το μωρό δεν πεινάει ουσιαστικά, ή το περπάτημα - κούνημα κλπ για να αποκοιμηθεί. Ένα άλλο βιβλίο είναι το The-No-Cry-Sleep-Solution-Foreword, αν δεν πετύχει αυτή η μέθοδος. * i was speaking with my friend that she just started with the solid foods, and i recommended to her the baby safe disposable feeder, manchkin or nuby, which makes it easy and safe for the babies to chomp on the food. It costs nothing and lets babies explore foods (especially those that are hard to chew, like the apple for instance, without me having to worry about them choking). you can buy them online from amazon or www.homoempatia.eu, an online pharmacy where you can get biological & homeopathic german baby products, like Holle, Hipp, Weleda in very good prices (i know for sure that they are much less expensive than in Italy and Greece). We buy in bulk with friends, so we split the shipping costs! Το εξάρτημα που βλέπετε στην φωτογραφία είναι πολύ χρήσιμο στις πρώτες εξερευνήσεις του φαγητού. Βάζετε μέσα το φρούτο ή το λαχανικό, και τα μικρούλια τρώνε με ασφαλές τρόπο εφόσον το δίκτυ εμποδίζει να κόβονται μεγάλα κομμάτια. Θα το βρείτε στο amazon ή www.homoempatia.eu, ενα online φαρμακείο όπου μπορείτε να ψωνίσετε διάφορες βιολογικές γερμανικές μάρκες όπως Holle, Hipp, Weleda σε πολύ καλύτερες τιμές από την Ελλάδα. Εγώ παραγγέλνω με φιλές ώστε να μοιραζόμαστε τα έξοδα. βρήκα εδώ οδηγίες και έφτιαξα pom poms και τα κρέμασα στο σαλόνι. κάθε φορά που έπιανε στις μικρές το απελπισμένο κλάμμα, τους πήγαινα μπροστά και τα έπιαναν και τα κουνούσαν και με ένα μαγικό τρόπο σταματούσαν..δεν ξέρω αν θα πετύχει και με τα δικά σας μωρά, νομίζω αξίζει η προσπάθεια! 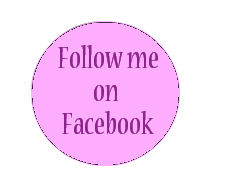 very nice blog.. Keep going and share with us nice topics! Wow! I'll try the "3 things in the mind" method with Melissa! Thanks! I was re-reading your posts and just noticed this smart safe baby fooder! Wow, I'll surelly order it shortly, as Melissa loves chewing! 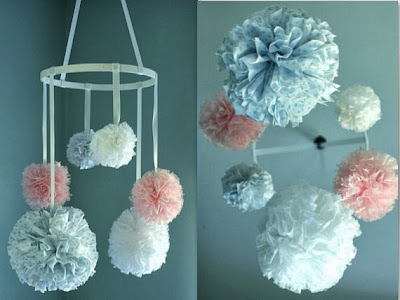 And instead of pompoms we have three paper baloons (florentine "rificolone") hung on the lamp, and it works just the same: when Meliss cries we approach her to them. Wind chime bells also work brilliantelly! For us, we would feed Marli, then give her a bath and about 30-45 min before bedtime, we would turn off the tv and put on some music (any kind) on a lower volume and let her play. She is FULL of energy so it's good for her to burn some of it off before bed. Otherwise, she's too excited to sleep. Then, 10 min before her bedtime, I put her pjs on, change her diaper and tell her it's bedtime. It's funny because a few days before she turned one, she suddenly didn't want me to rock her to bed anymore! I didn't know whether to cry or jump for joy...Now, she likes to lay down on her own with her bottle and I'll put her bottom until she falls asleep. Anyways, with all that being said, having 1 is hard enough so bravo to you for handling 2 :) Just be flexible and patient. With all these growth spurts and teething, their schedules will get inconsistent at times. Stay the course mama! You're doing a great job! !